Use 1 liter of Matrix for every 100 gallons of water. Sufficiently large that no filter bag will be required for most applications. Completely inert and will not breakdown. It need not be replaced. 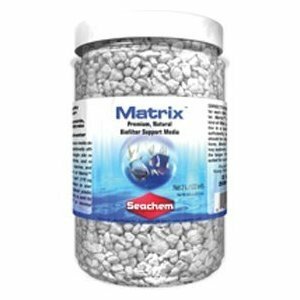 Since the majority of the bacteria are internal, Matrix may be rinsed when needed without damaging the filter. If you have any questions about this product by Seachem, contact us by completing and submitting the form below. If you are looking for a specif part number, please include it with your message.